Published in 1446, Biondo Flavio’s Roma instaurata is regarded as the first modern treatise on the topography of ancient Rome. In the context of the ongoing Edizione Nazionale delle Opere di Biondo Flavio, a check-list of the 51 manuscript witnesses of Biondo’s work, with a succinct description of each item and its most relevant bibliography, is offered. This new recensio updates and corrects the former check-lists published by the Istituto Storico Italiano per il Medioevo and by Anne Raffarin-Dupuis in her recent edition of Biondo’s treatise. Guarino da Verona, one of the most important humanist teachers, translated various Greek authors and commented on numerous Latin classics. While it has long been acknowledged that Guarino’s exegetical method can best be gathered from his students’ lecture notes or recollectae, little attention has been paid to these mostly unpublished documents. 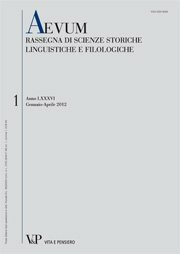 This article offers a preliminary study and partial critical edition of recollectae on the popular school author Valerius Maximus that are transmitted in two manuscripts and are attributed to Guarino in one of these witnesses. A comparison with the recollectae published under the name of another famous Quattrocento teacher, Ognibene Bonisoli da Lonigo, illustrates that even if not very original, Guarino’s commentary was certainly typical of the genre in the fifteenth century. Trivulziana, Fondo Morando Litta Visconti Arese, cart. 7 / 1. c. III). Gareth, also known as Chariteo, and with Cosimo Anisio. The former dedicated to Lelio an encomiastic sonnet, the latter a Latin poem, both of which are published here. In 1508 Baldassar Castiglione and Cesare Gonzaga composed Tirsi, a bucolic poem consisting of 55 stanzas, where stanzas 40-45 celebrate the poets active at the court of Urbino, near the duchess Elisabetta Gonzaga. Four of these poets, each one introduced in a stanza, are identified by the quotation of a line from their works. The authors of two of the quoted poems are uncertain, altough these poems enjoyed a certain circulation in manuscripts and printed books. The attribution to Castiglione and Gonzaga is here suggested; besides, four texts, mostly transmitted with these poems and similar in style, are published and also attributed to Cesare Gonzaga. Pietro Bembo appears as a model and reference for this literary milieu. From the late twenties to the early thirties of the 16th century Ludovico Beccadelli and Giovanni Della Casa lived in Padua, where they met a lively and varied environment, dominated by Pietro Bembo. The Fondo Beccadelli in the Biblioteca Palatina in Parma offers hitherto unknown texts (letters and poems), which are here edited for the first time: according to these documents, a new outline of the human and intellectual relationships of the two young men of letters is provided. The important role played Bembo on their literary education, even before the publication of his Rime (1530), is made clearer. and the so-called Eucharistic Quarantore (Forty Hours’ Adoration), a devotion originated in Milan in the same period. copy of which, with marks of reading, is preserved in the library of Casa Manzoni. Quotations or echoes of the Bible, found in several works of Svevo, are listed and discussed in the present article: they may be divided in two sorts. In the first group of passages the biblical reference is clear or so evident as to imply the author’s will to make the source explicit; the second group includes texts where the reference is hidden or disguised in a wider contest that attenuates its recognizability. The Bibliothèque Littéraire Jacques Doucet preserves a collection of unpublished letters between the French poet André Frénaud (1903-1997) and outstanding 20th-century Italian poets, critics, essayists and publishers of the years from 1946 to the mid-eighties. After an introduction on Frénaud’s life and poetics, this essay outlines the circulation of his works in Italy. The letters of the collection are described, with an analysis of a number of them written by poets of the Milan area (Fortini, Vittorini, Montale, Sereni, Solmi, Erba, Risi): object ot the letters are friendly relationships, book exchanges and reviews, as well as shared publication projects, particularly intense during the fifties. In the fall of 2013, at the Universita` Cattolica, Milan, a conference will be held to mark one hundred years since the birth of Giuseppe Billanovich. For the occasion, a bibliography of his writings and of writings on him is published here, in tribute to his memory.